Marsa Shagra is a great place to dive. I have seen sharks, turtles, moray eels, leopard stingrays inside the bay. 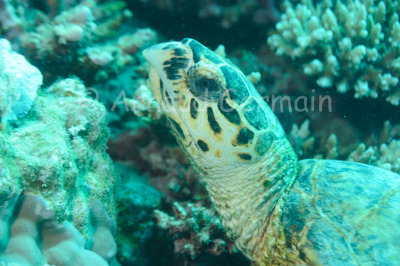 This hawksbill turtle was resting on some coral, about 15 metres down inside the bay, on the North side of the bay. I approached very cautiously as I hate disturbing the subject I am trying to photograph. I managed to take pictures for about 3 minutes and left this wonderful animal in peace. I knew I had done well as it was still in the same place when I left! Nikon D700, Nikon 28-105 mm macro at 105mm, F5.6, 1/80th, ISO 400, Ikelite Housing and Ikelite DS160 strobe set on TTL -1.3EV.